Before you ask…. yes, Singles Day actually exists! It’s a holiday celebrated in China today, November 11, for single or unmarried people to treat themselves with special gifts. Here in our country, we love special occasions, that’s why we’re joining in the fun! And the great thing is, the good people behind Eatigo has a big gift for the “unattached”- with their Singles Day Promo. 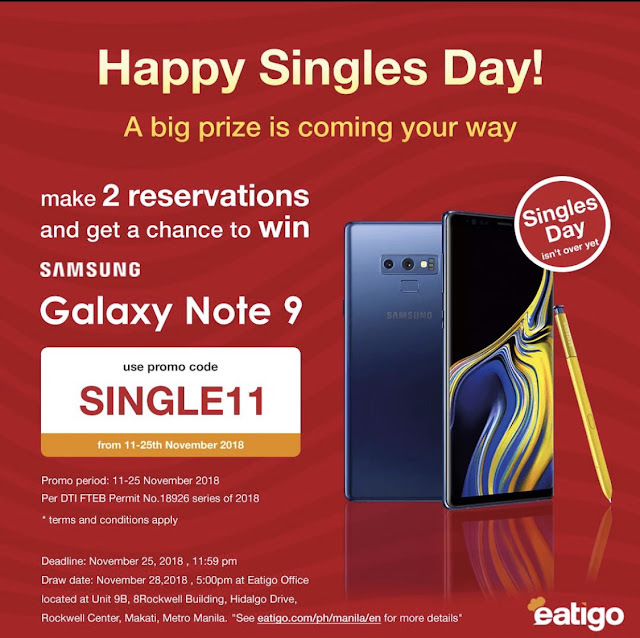 1.Have a minimum of 2 attended reservations for 2 pax using the promo code: SINGLE11 on Eatigo between November 11-25, 2018 and get a chance to win an Samsung Galaxy Note 9. 2.Customers with 2 attended reservations for 2 pax using the promo code: SINGLE11 on Eatigo between November 11-25, 2018 will be sent a form to fill out through e-mail. Once e-mail is filled out, user will automatically be eligible to join the raffle. 3. The winner will receive a brand new Samsung Galaxy Note 9 and will be notified via e-mail, registered mail, and SMS. 4. The announcement will be made on November 30, 2018 on Eatigo Philippines’ Facebook page- so stay tuned! Being single doesn’t mean eating alone. Invite a friend and discover new restaurants! Download Eatigo now, sign up, and enjoy scouring the app for hundreds of their delicious deals to restaurants all over the metro. Visit https://goo.gl/PqhWZx. Who knows? You just might be the lucky winner!